As Tales of the Cocktail 2015 is kicking off this week, New Orleans will soon be inundated with people in the cocktail biz coming to take part in the various festivities and events. At last count, an estimated 17,000 “bar professionals” are anticipated in the city for the week-long affair. But these aren’t just your ordinary bartenders. At least, they don’t call themselves that. No, these are your fancy, cultured types. They are self-proclaimed bar chefs. Spirits engineers. Even the term mixologist will simply no longer suffice. These are cocktail artisans. Masters of the drink. And they want to be sure that you know it. Y ou can’t miss them. They have a certain sophisticated hipster style, reminiscent of the heyday of the classic cocktails they craft. Everywhere you look during Tales of the Cocktail you will see men sporting handle bar mustaches and suspenders. The only thing they’re missing from their bohemian ensemble is a monocle (which would actually come in quite handy for them to focus in on the drink they are fashioning, while still being able to stare across the bar condescendingly at you with the other eye). And the women? They will be wearing 40’s or 50’s-style vintage dresses in various colorful patterns, perhaps with a little tulle built in under the skirt to make it flouncy, like they just stepped out of a Trashy Diva shop in the Quarter. Their hair is often styled into a pompadour and accented with a big flower, usually red. I once heard that, statistically speaking, women working in the service industry who wear red flowers in their hair get bigger tips. I have no idea why this would be, nor if it is even true, but apparently someone, somewhere, found evidence to support it. In the case of Tales, however, I don’t believe the ladies do it for the tips. 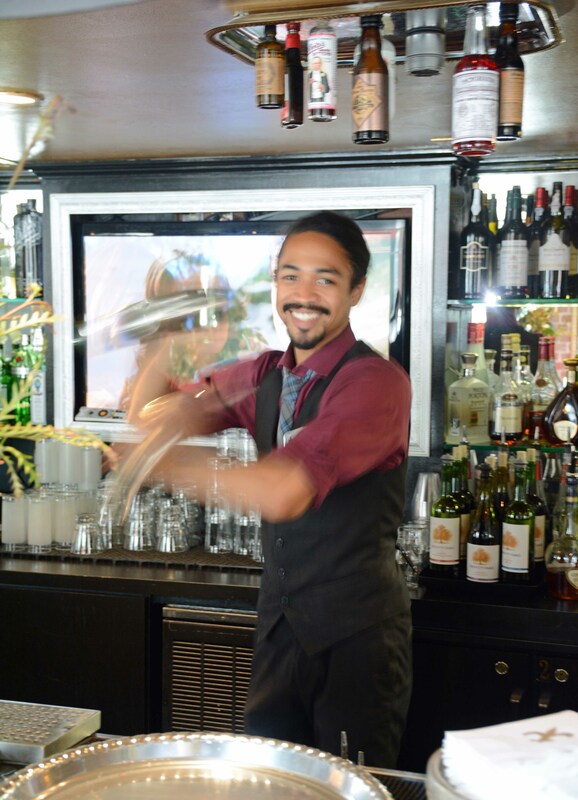 I am sure that they are already tipped generously for their superior bartending skills alone, and do not need any further assistance in this area. Rather, the hair flowers are certainly for the look. Not to mention that this has a certain practical element. In a pinch, a lady could pull the flower out of her hair to muddle into a drink. I have worked as a bartender for nearly eight years now. But I have always referred to myself as just that: a bartender. Personally I find their style elegant and charming. But even better, it makes packing for their trip to New Orleans that much easier. Having a single, go-to outfit to wear the entire time leaves more room in their valises for what really counts: the tools of their trade. This way they can travel with trunks full of shakers and jiggers, at least one bottle of absinthe, a muddler as big as a Louisville slugger, and shrubs, bitters, infusions, herbs, zests, simple syrups in 27 varieties, and an endless array of tinctures (a word which always sounded to me like something you wouldn’t dare discuss in front of your mother). I have worked as a bartender for nearly eight years now. But I have always referred to myself as just that: a bartender. And maybe on a particularly good day, a mixologist. 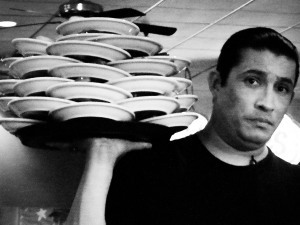 I never thought of myself as a chef, nor an artiste nor a virtuoso. I just know how to make a good drink. I love a well-crafted cocktail as much as the next person, and I am always excited to see a creative concoction on a cocktail list. But let’s face it, we may be getting a little carried away with the whole craft cocktail culture these days. Cocktails have become so snooty and high-falutin that most of us normal folk can’t attempt to decipher their contents. Half the time we don’t even know what we’re consuming. Clement Creole Shrubb Liqueur d’Orange? Meletti Amaro? Bonita peach Rooibos Tea Syrup? It’s kind of like if you’ve ever dared to try to interpret the ingredients list printed on a bag of Cheetos. FD&C Yellow Number 5? Riboflavin? It has become increasingly trendy to put any far-fetched, odd, or unusual thing you can get your hands on into a beverage. The weirder the ingredient, it would seem, the better. Some of the more bizarre things I have seen on cocktail menus include vinegar, dandelions, and caviar. There are herbs such as marijuana and catnip, and foods like foie gras and Greek yogurt. How about some rum infused with a Cuban cigar? Or tequila infused with chorizo? And if you like your booze with a nautical twist, I’ve heard of using everything from squid ink to seaweed to the gonads of a sea urchin. Yes, that’s right, sea urchin genitalia. Would you like that in a souvenir cup? Any bartender worth their salt rim these days is adding bitters to their cocktails. Bitters that come in a range of flavors from rhubarb to Memphis Barbecue to chocolate molé. There are even Jamaican Jerk and sriracha bitters. But get out that eyedropper. You need to put in exactly 2.78 drops of bitters in your cocktail. Be careful, be precise, be accurate. If you add three drops, you will certainly overpower the delicate balance of the drink components and ruin the flavor profile and mouth feel of the beverage. With all the plants and herbs and live flowers and roots thrown into the cocktails of today, modern drink recipes read more like a witch’s spell, and the cocktails, their magical brews. Can’t I just get a vodka tonic? Not as easily anymore, it appears. 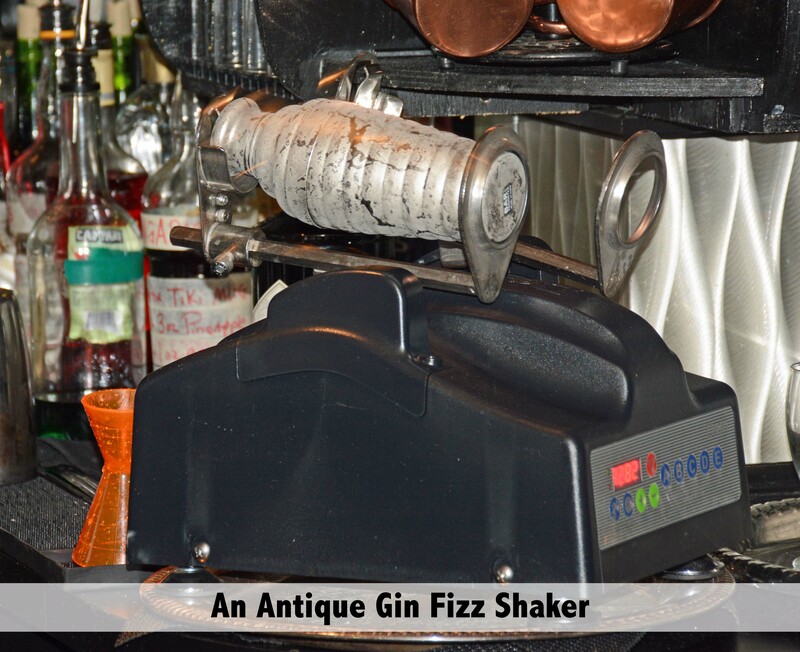 Gone are the days of your basic drink with one simple liquor and a single mixer. These days cocktails are required to have a minimum of eight ingredients, at least one of which that has been made from scratch, with something that was once alive (and often with something that still is), something hand-squeezed, something infused, something shaken, muddled, raw, candied, made in-house, home-grown, local, imported. Something borrowed, something blue. I learned just the other day that during Tales of the Cocktail, it is apparently a thing to milk a cow in public in order to make the world’s freshest Ramos Gin Fizz. They drag some poor, terrified cow into a crowded forum, and milk her while thousands of cocktail-thirsty savages look on, before immediately putting the cream extracted directly into the drink. What is obviously lacking in this scenario, besides a certain amount of sanity, is the chicken. I mean, if we are going to have the world’s freshest Gin Fizz, we need the eggs used to be equally as fresh, and therefore harvested directly from the chicken. And so it is that a refined cocktail with more than a hundred years of history becomes a barnyard special. It helps bring the snootiness level of the drink down a couple notches. Some traditionalists feel that the nouveau cocktail gurus are tainting the classic cocktails that New Orleans is famous for. Milking a cow live is a prime example. 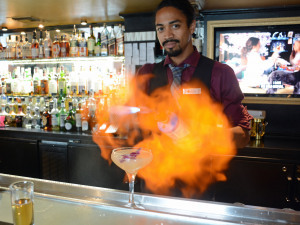 By trying to embellish and improve upon these old standbys, more conventional bartenders believe that today’s bar chefs are actually ruining the old classic drinks which they feel are better off left alone. I guess some might say that the classic cocktail may have bought the farm. But the craft cocktail craze doesn’t stop there. What about the ice that goes in your drinks? Ice cubes. Crushed ice. Charred ice. Ice spheres. Ice spheres infused with bourbon-soaked lamb’s pancreas. Ice chips. A chip off the old block. Dry ice. No ice. God forbid, don’t put ice in that drink! A cocktail of that quality should never touch ice. Yet it’s not just what you put in your drink, it’s also what you put on it. And spirits engineers are just as particular on this point. I have been yelled at by a bar chef for attempting to garnish a Ramos Gin Fizz with an orange slice, despite the fact that this has become common practice here in New Orleans. She considered it a sin of the same caliber as, I don’t know…drinking boxed wine. How dare I? Garnishes are serious business, and have become just as extravagant as certain cocktail ingredients. There are martinis garnished with crab claws, or cedar chips, or an apple hand-sculpted into the shape of a swan. There are rock candy swizzle sticks and spearmint cotton candy dipping sticks. I’ve seen drinks garnished with smoking cinnamon bark, or frankincense and myrrh smoke. How about a peppermint vodka-infused quail egg? Lucy’s Retired Surfers Bar in the Warehouse District garnishes their “Da Killer Blue Whale” cocktail with a giant plastic whale. But wait, did you make that plastic whale from scratch? Garnishing has become an art form. Don’t forget to spank the basil! And what about the vessel in which your meticulously fabricated cocktail is served? You mustn’t confuse your Collins glasses with your highballs, nor your rocks glasses with your Old Fashioned’s. Don’t even think about serving a Pinot Noir in a Bordeaux glass. Mixing any of these up would surely cause dangerous cross-contamination. And these days, even the glassware and cups have gotten creative. You can sip your favorite drink from a ruby-encrusted high-heeled glass slipper, or a ceramic, shatter-resistant flower pot. Have your Mardi Gras Punch in a limited release collector’s edition vintage recycled 1953 Mardi Gras cup from the Krewe of Thoth. Drink a Singapore Sling in a Terminator Tiki Mug. 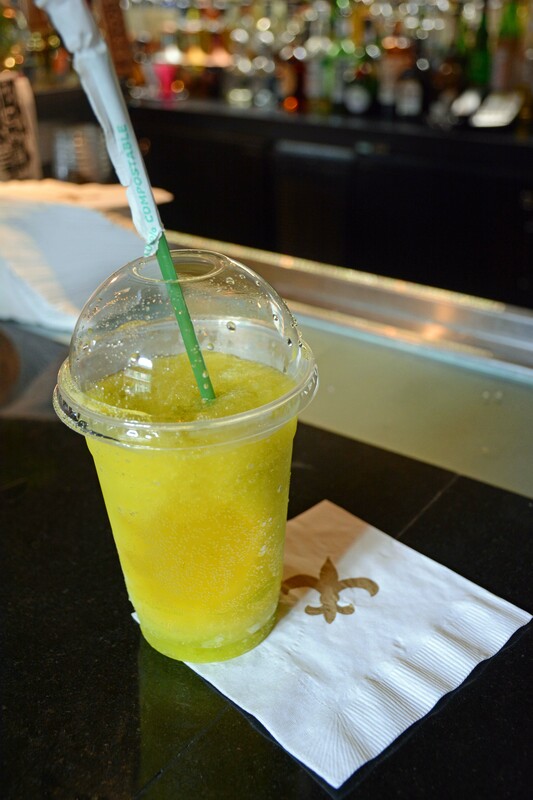 Or imbibe a “slushie du jour” from a biodegradable eco-friendly cup and straw made from corn. Don’t get me wrong. I realize the effort and ingenuity required to invent and perfect an excellent cocktail. It’s not easy to create a beverage which is both tasty and unique. And frankly, some of these drinks are downright genius. But at the same time, there’s a fine line between a darn good cocktail, and taking yourself just a little too seriously. Not to mention I see a few practical constraints within the craft cocktail world. As a service industry worker, I can recognize the difficulty and inefficiency of some of these fancy cocktails. Having to make a ten-ingredient cocktail to order, while measuring or muddling or shaking each and every ingredient one-by-one (with your guest waiting impatiently throughout the lengthy process) is extremely labor-intensive and time-prohibitive. And a sure way to put you right into the weeds. And as a cocktail consumer, many of these craft cocktails have priced themselves right out of my budget. I still think $9 for a drink is on the upper end of acceptable. Though I know that $12 is now the norm in more prestigious bars. But 20 bucks or more for a martini? No, thank you. Still, 20 bucks is a steal in a lot of cases. You and six of your friends can get a whole pitcher of Gumbo Bloody Mary at the Bourbon O Bar on Bourbon Street for the bargain price of just $70. (It supposedly serves seven, though that obviously depends on how big a drinker you and your cohorts are). There is a bar in London which serves their “Salvatore’s Legacy” cocktail for $8316, made from Cognac and other liquors nearly as old as New Orleans itself. Or, head to the White Bar Inn in Kennebunk, Maine, to drop a year’s salary on a single drink. Their $40,000 Ruby Rose Cocktail is a fairly standard fruity martini, but garnished with a four-carat ruby. Whatever is your take on the whole craft cocktail craziness, I hope you will enjoy Tales of the Cocktail this week, and all that it has to offer. But while you are sitting through a lengthy seminar on organic, environmentally-safe, locally-produced tinctures, I will be kicking back on my couch. With a bottle of grape-flavored Taaka vodka. Served over biodegradable hand-poured ice, sculpted in-house in my very own Family Dollar plastic ice trays. And mixed with a huge glass of Crystal Lite. Which I made from scratch.